After buying our gently used 2016 Camry last fall, I’ve been quite a bit more diligent about keeping it clean than I was with the MkV Jetta that preceded it. With that in mind, I decided I’d better go a bit farther than just regularly washing it and do a clay bar and wax treatment a few times a year. With fall on our doorsteps and winter quick to follow, I figured now was the time. In the past I’ve used traditional clay bar systems and while they are quite effective, they also take a good bit of time. I don’t have nearly as much time for that now that I’m a big boy with a wife and son and a litany of “to-dos”, so I looked for a more time-efficient alternative. The advantage it claims to hold over traditional clay is that it can be used during the wash cycle or after a wash with a lubricant, can be rinsed off if dropped, and is reusable up to 20 uses. I read a number of reviews, which were mostly positive, and decided to give it a try. I ordered mine on Amazon for about $16, but I’ve seen it advertised anywhere from $12-20. At that price it is more than competitive with a traditional clay bar kit and has the added bonus of being reusable. 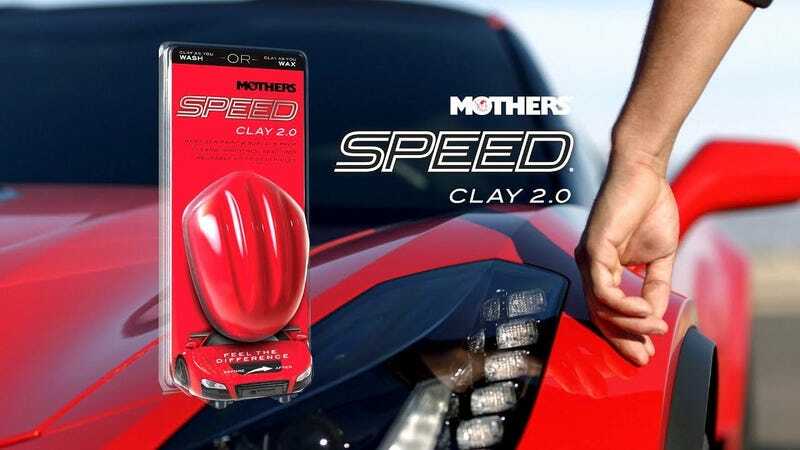 As I mentioned before, Speed Clay can be used either during the wash cycle or after with a lubricant such as spray wax. I chose to use it during the wash cycle and was very pleased with how easy it was. The directions state to wash a section of the vehicle with your regular soap and sponge/mitt combo, rinse, then dip the clay bar in soapy water and go over the recently-washed section in linear motions. I used two buckets, both filled with water and Meguiar’s Gold Class soap. I had my sponge in one bucket and used the other bucket for the clay bar. It obviously took me longer than just a regular wash would have, but I was able to wash and clay the Camry in under 2 hours. My only nitpick was how rigid the bar was, which made it a little difficult to use on curved surfaces. To be fair, I went into this with tempered expectations, having used a traditional clay bar in the past. Despite the mainly positive reviews, I still expected there to be a trade-off between convenience and effectiveness, and there was. The Speed Clay 2.0 did a very good job of removing the vast majority of surface contaminants, but it struggled to completely remove rail dust spots and the surface of the paint wasn’t absolutely smooth afterwards. Overall, it did a great job given the ease of use and relatively small amount of time and effort required. I’m more than pleased with my purchase of Speed Clay 2.0 by Mothers and would wholeheartedly recommend it to anyone who wants to take good care of their paint, but may not have enough time to devote to traditional clay. It removes the vast majority of surface junk without breaking your back, wallet, or eating up a whole afternoon. Naturally, after doing a clay treatment, I wanted to apply some kind of sealing coat to protect the finish I had just spent time cleaning. I chose Meguiar’s Fast Finish for much the same reason as choosing Speed Clay—it’s fast and easy to use. First and foremost, let me mention that Fast Finish isn’t a traditional wax. It’s more of a sealant, meaning that it won’t fill in scratches and swirls and make the paint look super shiny. It’s main purpose is to provide a hydrophobic layer on top of the paint to help sheet water off and prevent contaminants from sticking. It can be used either by itself, or on top of a traditional wax. Having said that, this stuff is great. It is startlingly easy to use and super fast. For ~$15 you get an aerosol can and a nice big microfiber cloth. After the car has been thoroughly dried, just fold the cloth into eighths, spray a small (3-4 quick strokes) amount of Fast Finish onto it, and wipe it onto a section of the car. You can do half a hood or a whole door at a time. After applying, flip the cloth over to the dry side and do one final wipe and that’s it. I literally did the whole car in under 15 minutes. Time will tell how well Fast Finish holds up to the elements. Meguiar’s claims it lasts up to a year, but I have my doubts about that. Even if it doesn’t, I won’t mind because it’s so cheap and easy to apply. I’d estimate that I can get 7-10 applications out of the aerosol can. Just like Speed Clay, I’d highly recommend this stuff to someone who is short on time.